Then ... Harry Caul, as befits a man of simple means, uses San Francisco's Muni buses to get around town. Here, wearing his ubiquitous plastic raincoat, he gets off the 3-Jackson to make a phone call to 'The Director', the executive who hired him to snoop on his wife. ... and Now, the modern version of the 3-Jackson still serves this stretch of Sutter Street. Then ... He crosses the street to a public phone booth. There are several clues to this location - the red sign on the side of the building down the street belongs to the Hotel Carlton at 1075 Sutter; there's the Travelers tavern at 1176 Sutter, and at left alongside the phone booth is the yellow and maroon tiled Fosters Cafeteria. This can only be the corner of Sutter and Polk. (map). ... and Now, the Hotel Carlton is still there, the tavern too, currently the R Bar. Fosters on the corner though has been replaced by another eatery, El Super Burrito. The phone booth (which could have been a movie prop) is not there now. ... a vintage photo ... this 1940s photo looking north up Polk Street from Sutter captures the Polk Street side of the Fosters restaurant. 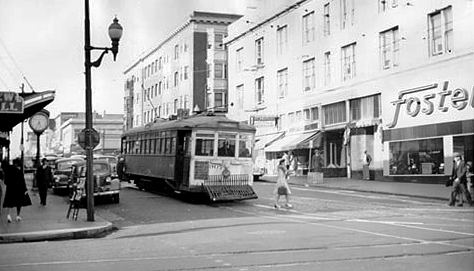 Back then the trams ran on tracks along both Polk and Sutter. Check out that public clock on the left - not everyone could afford a watch in those days. Note too how well folks dressed back then when they stepped outside, especially the lady crossing, with heels, purse, fur coat and hat. ... and Now, the same view except that today's street fashion, sadly, has become slob casual. In this carefully composed shot he arranges a meeting with the Director. "Is that ... payment in full? ", he asks, anxiously.